Today in my A to Z trip through December, we are on R! To check out the earlier posts, click here! When I was growing up, fashion magazines used to always talk about the little black dress. I don't know if they do still, but I imagine that they do because the little black dress is versatile, economical and functional. Everyone should have a little black dress. But I always wanted a red dress, just like that Chris de Burgh song Lady in Red. At Christmas, the color red becomes something even more special. It shows itself everywhere. Perhaps like evergreens, red is a spark of life in an otherwise drab and dreary wintery world. And, red is complementary to the color of those beautiful evergreen boughs. Everything comes to life with red. If I was going to explore the psychology of red, I might guess that it is symbolic of the color of life, the color of blood. But blood isn't particular pretty, so I'm not sure that is it. Anyway, I thought I needed to dedicate today to red! What do you think? Red dress or black dress? 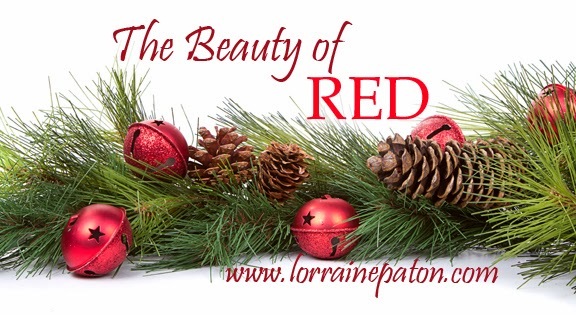 I have always loved red too - it makes me feel cheerful (probably because of its' relationship to Christmas). But I do like the 'little black dress' too. Maybe I just like dresses? I love that song Lady in Red too. Well there is that 'blood red' which isn't always so cheerful looking. I usually wear the LBD too - but it's nice to add just that wee touch of red to it. Mary - LOL - yes, blood red isn't always so cheerful. G is for 25 Gifts for Writers!